Meal replacement bars and drinks can provide a convenient solution for dieters on the go. Not all meal replacement products are created equal, however. If you are trying to lose weight, choosing the right one can help you achieve your goal, while choosing the wrong one could easily sabotage all your hard work. The best diet-friendly meal replacement products are high in nutrition and low in calories. They should satisfy hunger, quench cravings and provide adequate energy fuel. If you are looking for maximum nutritional benefit with the lowest calories, Dr. Schulze's SuperFood Bar might be for you. This organic bar combines raw fruits, nuts and a wide variety of green superfoods, such as spirulina and barley grass, to provide long-lasting energy and ample nutrition at just 165 calories. It also contains 6 g protein. Greens Energy Bar is another organic, and nutritious, choice. It is similar to Dr. Schulze's Bar, but it also contains soy protein. It has 250 calories and 7 g protein. Vega Whole Food Vibrancy Bar is also a healthy "green" option made from raw fruits and nuts. It is gluten-free and contains 200 calories and 9 g protein. The all-natural Lara Bar is sculpted from raw dates and nuts; a handful of other ingredients, such as chocolate, apples or raisins, are added to create specific flavors. 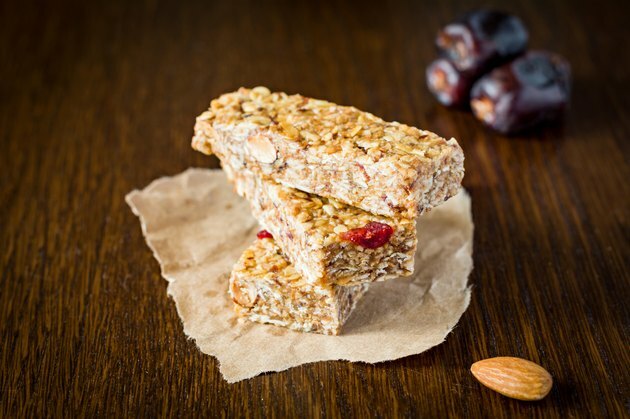 Despite its limited ingredients, this gluten-free bar is loaded with wholesome nutrition and is perfect for those seeking to avoid additives and preservatives. The Blueberry Muffin bar contains 190 calories and 4 g protein. Pure Bar is similar to the Lara Bar, and just as delicious. The Blueberry bar contains 190 calories and 6 g protein. CookingLight.com named it the "Best Natural Bar." If you are looking for a highly satiable bar with a bit of crisp, Clif Bar is the winner. The Black Cherry Almond took the honor of the "Best Meal Replacement" in the CookingLight.com rating. Made with oats, soy protein and over a dozen other ingredients, this bar contains 250 calories and 10 g protein. The Kashi Go Lean Crunchy Bar is another good alternative. The Chocolate Peanut bar contains 180 calories and 9 g protein. If you prefer to drink your meal, consider trying a smoothie. Odwalla Protein Monster smoothie is full of soy and milk protein, as well as added vitamins and minerals. The Vanilla Protein smoothie contains 400 calories and 36 g protein per bottle. The Naked Protein Zone smoothie is made with natural fruits and fruit juices, with added soy and whey protein. One bottle of Protein Zone Mango has 440 calories and 32 g protein. The Stonyfield Organic Super Smoothie is another nutritious alternative. This yogurt-based product contains probiotic cultures. The strawberry flavor has 230 calories and 10 g protein. With all meal replacement options, pay attention to the added or natural sugar content. While carbohydrates provide energy, high amounts may lead to fat gain and counter your weight-loss efforts.